We’ve just come back from a wonderful trip to Norway. We started off with a couple of nights in Oslo which was just so lovely. The people were incredibly friendly, the sun was shining and we got to visit a cheese shop! 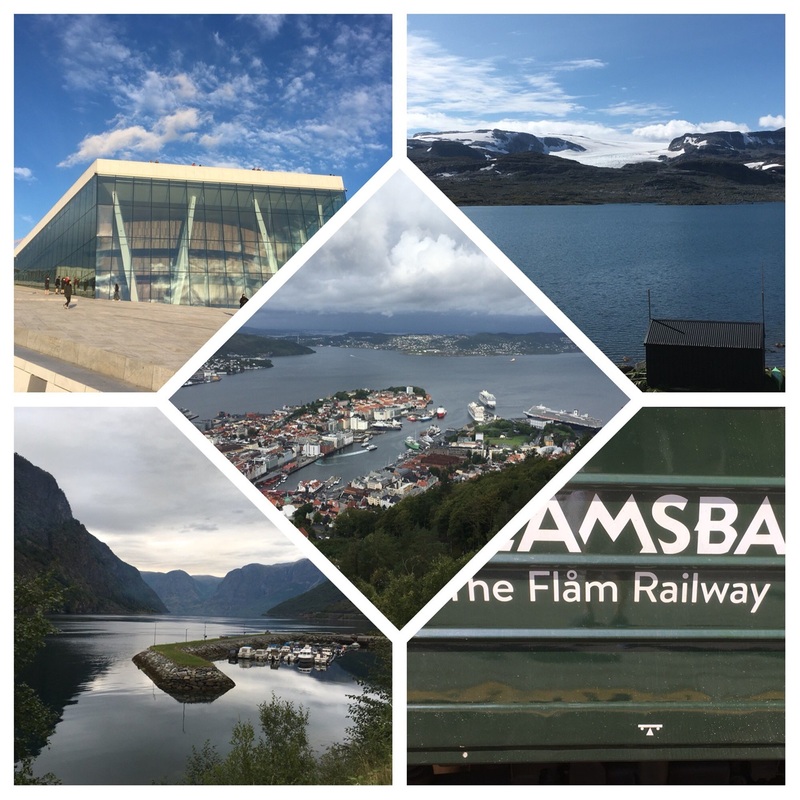 Then we went by train along to Flam - this takes you on the Flam railway which is an incredible line. It is only 12 miles long but during those 12 miles it has 10 stations, 20 tunnels and one bridge! We had just one night in Flam (which is more than enough time to look round the village) before heading off up the fjord by boat to Bergen. A couple of wet, drizzly nights in Bergen and we were heading back home to Heathrow. When most people think of Norwegian cheese I would imagine that Jarlsberg and ‘that brown one’ (aka Gjetost) come to mind. However 2 years ago a Norwegian cheese was named champion at the World Cheese Awards in San Sebastian. Kraftkar is a blue cheese from Tingvollost in Nordmøre, Norway. It was voted top for its nicely developed mould, fantastic texture with crumbly soft creaminess. The World Cheese Awards are going to be in Norway in November and we have been lucky enough to have been asked to go and help to judge the entries. We were judges in London for the awards last year and its a real privilege to be asked to go again. It was a pure coincidence that we had also booked to go on holiday to Norway this summer but it has meant that we’ve done a bit of a recce in advance! Bergen was beautiful and it will be lovely to see it again in a couple of months. But back to life here in Pangbourne… I’m trying to introduce some new guest cheeses into the counter. I’ve made space to allow us to feature a cheese for a week or so. I’m hoping that I’ll be able to find a permanent space for any cheese which proves really popular so our customers will be directly influencing the make up of our counter. Our recent guest cheeses have included Clara (a gold winning goats’ cheese from this year’s British Cheese Awards) and Quicke’s cheddar infused with elderflower (a real taste of summer!). I’m hoping to team up with our french cheese importers to guest some french delights so keep an eye on our social media pages for more information. There’s one more week of the school holidays to enjoy and Angela is currently away with her family. They’ve gone over the pond to visit Mickey Mouse in Orlando. She’s taken a cheese bag with her so there there will be some odd photos cropping up on our Twitter feed. I’m not sure she’ll be finding any American cheeses to try but if she does we will be sure to report back! I proposed to Ali after a spectacular American cheeseboard so we know there are some fantastic cheeses being made in the US. 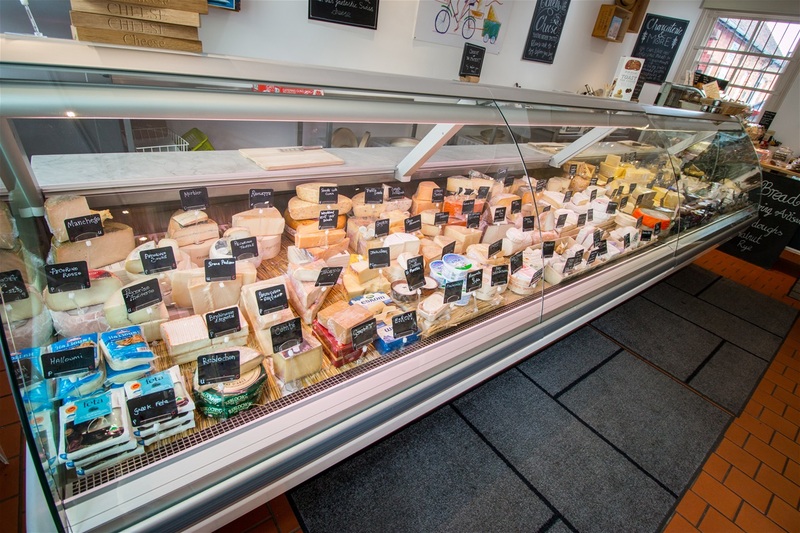 Unfortunately it’s just impossible for us to be able to feature them in our cheese counter so we will have to just make do with the 130 cheeses that we do have!! It was a really fabulous week, I visited the home of 23 of our cheeses and I managed to spend time in the shop doing my day job too! 12 weeks post surgery and things are going well 😀 Walking is getting easier every day and I’ve been back behind the wheel of the car which is a big relief. We live in a tiny village and so not being able to drive has meant I've been completely reliant on others (mainly Ali) to drive me around. Single Gloucester is a young cheese with a mild, delicate flavour and traditionally it would have been made for the farmer's family to eat whereas the Double Gloucester went to be sold at market. Single Gloucester has a PDO which means that it has a protected designation of origin. This means it can only be made if certain parameters are met. These state that the cheese has to be made in the county of Gloucestershire, using milk which comes at least in part from Gloucester cows. There are only 4 cheesemakers who currently make the cheese - Charles Martell, the Smart Family, Jonathan Crump and Godsells. We already sell Charles's fabulous cheeses and so we thought we'd go and meet the Smarts and Jonathan as we found we could buy Godsells quite easily so wanted something a bit more exclusive! Diana Smart and Charles Martell were responsible for gaining the PDO status for their Single Gloucesters. Diana started to make cheese 30 years ago using a traditional recipe. Her son, Rod, is now the cheesemaker and he opens up his cheese house to the public so he can share his passion of his cheeses. We were thrilled to be guided through what goes into making his cheese so special and I for one was fascinated by the huge Victorian cheese presses that he uses! After we'd watched the cheese being hand ladled into its moulds we were treated to a tasting (always the best bit!) and we were given some to take back to the shop for Angela & Jo to try too. Then it was on to Standish Park Farm to meet Jonathan Crump. Jonathan is unique amongst the makers of Single Gloucester in that his is made purely from his own herd of Old Gloucester Cows. As we arrived we could see the cows out grazing in the fields. Old Gloucesters are truly beautiful beasts. They are one of the oldest breeds of cattle in Britain and are a deep brown colour with a very distinctive white stripe which runs along their backs, over the tail and under their bellies. Like every cheesemaker we meet, Jonathan was very hospitable and keen to chat to us about his cheese. It was lovely to hear his passion for both his cheese and his cows. We got to taste his Single and Double Gloucesters and again bought some back to base for the rest of the team. All in all it was a fabulous trip and the four of us did a perfect amount of sightseeing as well as exploring the fabulous Forest of Dean. To be fair I think our dogs explored more of the Forest than we did although we all had a bit of a shock when we came across a family of wild boar! So that's it for now, we're off to Chapel Row Fayre at the weekend so if you're in the Bucklebury/Chapel Row area why not pop along for a chat and a spot of cheese! Ali and I have just got back from a couple of days 'up north' where we were visiting one of our suppliers. Whilst we try to get as many cheeses as we can direct from the cheesemaker, it isn't always possible (or practical). Carron Lodge are based near Preston but we thought we'd pay them a visit and have a look around their farm and see their cheese production. 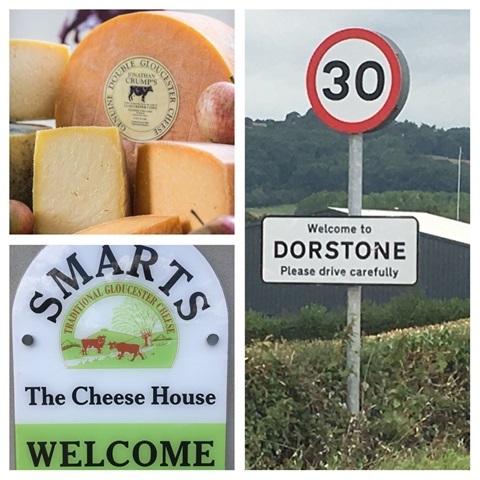 They also have great links with many of the northern cheesemakers and so are a key part in us getting the very best cheeses that we can for our customers. We do find that the more time we spend with cheesemakers and suppliers, the better the quality of the cheese that we can source. Cheese is the most important part of our shop and so every link we can establish the better it is for you, our customers. The set up at Carron Lodge is really quite amazing! We had a look round their maturing rooms as well as their storage areas and saw how all the processes there work. It was fascinating to see what happens from the moment a customer rings them with an order to it being delivered the next day. We also saw their very cute buffalo herd and I'm very keen to get some of their buffalo cheese to try. I also must confess that I had an ulterior motive for visiting Carron Lodge on this particular Friday... my beloved Everton FC had a home game on the Saturday and whilst Ali and I usually travel up and back to matches in a day it was very lovely to be able to stay in Liverpool overnight. We spent a fabulous morning looking around the Walker Art Gallery and the Tate Liverpool, both are well worth a visit. We also managed to pop into a couple of cheesemongers as well 👍🏻 We do tend to go out of our way to visit other independent cheesemongers and it's always good to see what other people are offering to complement their cheese counter. This week sees an influx of Welsh cheese into the shop as we celebrate St David's Day. Our Snowdonia cheddar has proven to be very popular. We're also gearing up for St Patrick's Day. We love to celebrate all events with a piece of cheese 😀 Keep an eye on our Twitter feed and Facebook page for all of our latest news. Ali and I have recently been over to Marlow to visit one of our area's newset cheesemakers, Lynda Hill of Marlow Cheese. Lynda decided in 2015 to fulfil a lifetime ambition to become a cheesemaker. She went on a course at the Artisan School of Food and learnt all the ins and outs of the cheese world. After much deliberation she decided to embark on making a soft, lactic style cheese. The twist with this cheese is the fact that it is made from 100% Guernsey milk, all produced just a few miles from Lynda's base. The resulting cheese is called Cygnet and is deliciously smooth and creamy, with a wonderful buttery taste and a soft paste. 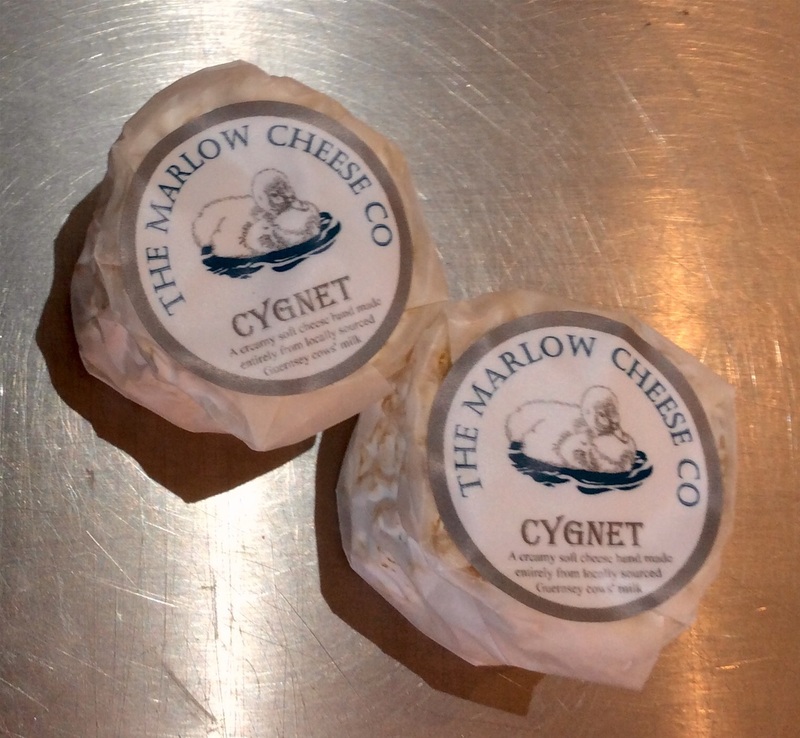 We're hoping to stock Cygnet in the very near future - keep an eye on our facebook page and twitter feed. I've been down to Somerset this week to pick up cheeses. We have 4 cheesemakers who I visit every 6 weeks or so: Montgomery Cheddar, Batch Farm, Westcombe Dairy and White Lake Cheese. As you'd expect from Somerset the majority of the cheeses are cheddars but there are some other gems thrown in! Jamie Montgomery is often referred to as the King of the Cheddar. His mature West Country Farmhouse Cheddar is 12 months old when I collect it. It is an unpasteurised, traditional cloth bound Cheddar which has a deep, nutty flavour. It is probably my favourite Cheddar. In fact Ali and I like it so much that we had a ring of it as a base for our wedding cake! From Montgomery's it's a short drive cross country to visit the Westcombe Dairy. I always pick up a quarter of their delicious traditional Cheddar but sometimes I also add some Duckett's Caerphilly to my order. Although Caerphilly is traditionally a Welsh cheese, it's been made in the West Country for over 100 years. The Duckett's Caerphilly has a lovely fresh taste and you can almost taste the grass that the cows were munching on when they produced the milk. My last stop is at White Lake Cheese. 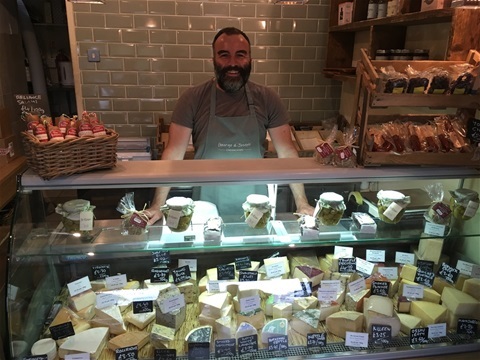 Pete and his team on the farm produce some of our favourite goats' cheeses as well as a couple of our Guernsey milk cheeses. Pete's Rustic Rachel is our best selling hard goats' cheese and it's so good that even people who don't like goats' cheese tend to buy it. We also stock Pete's Longbow and Nancy which are crumbly cheeses as well as his ash covered goats' log, Driftwood. I picked up a new cheese from him this week which is the Goddess. This is a semi-soft curd cheese which is made from Guernsey milk and then washed in Somerset Cider. It is delicious and goes done very well with our ciders here in the shop 👍🏻. We also stock Pete's spongy Guernsey cheese called Morn Dew and his Sheep Rustler, both are delicious! Ali and I have just been over in Dublin for the weekend. We'd offered last summer to take my mum to Dublin and we have finally managed to fulfil our promise, and of course whilst we were there we couldn't resist exploring some of Ireland's cheeses. We already stock a few Irish cheeses in the shop - Cashel & Crozier blue (made from cows' and sheep's milk respectively) as well as a washed rind cheese called Gubbeen & its Smoked version. We've also had Coolea in the past as well as Coolea with cumin but we figured that Ireland had a lot more to offer. Our first port of call was the cheese counter in Fallon & Bryne where we met the fantastic Bobby. Us cheesemongers are a friendly bunch on the whole and we always love the opportunity to be able to talk cheeses with a fellow enthusiast. Bobby guided us through a tasting of his favourite Irish cheeses with a rather fab goats' Gouda from Killeen being his top choice. A lot of the Irish Goudas are made by Dutch families to traditional recipes and the Killeen is no exception. We felt very welcomed and have even secured an invite back to go out and about around Ireland on a magical mystery cheese tasting tour. We just need to find another clear weekend in order to be able to take Bobby up on his offer! Our next stop was Sheridans. Kevin and Seamus Sheridan are responsible for re-igniting artisan cheese making in Ireland. They've made it their mission to bring great farmhouse cheeses to the general public. Their shop in Dublin is small but perfectly formed. 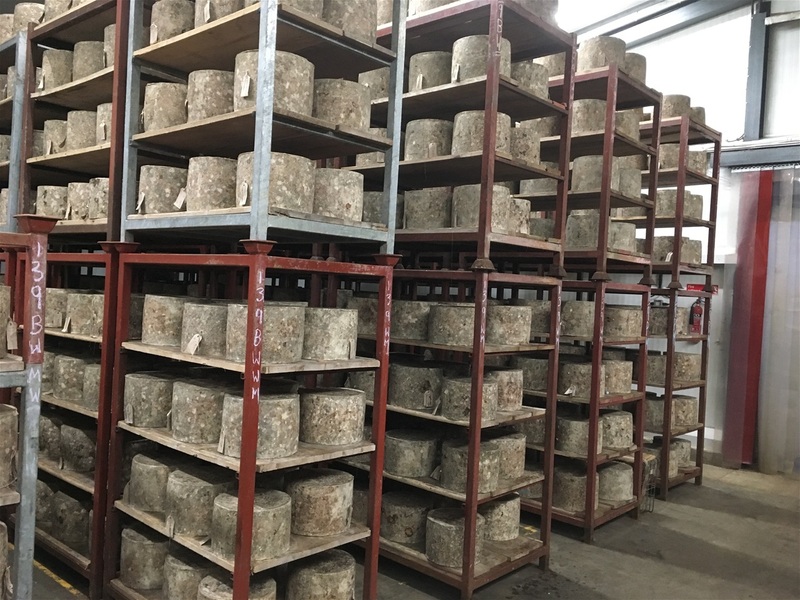 They use a mixture of fridges and a temperature controlled shop to allow them to have some cheeses permanently which makes it easier for their customers to be able to appreciate their fine selection. It is a lovely way to display cheese and I know that there are several shops that adopt a similar layout. However much I'd love to turn our shop into a large cold room I don't think the building is really designed for it and so we'll be keeping hold of our serve over fridges for the foreseeable future. 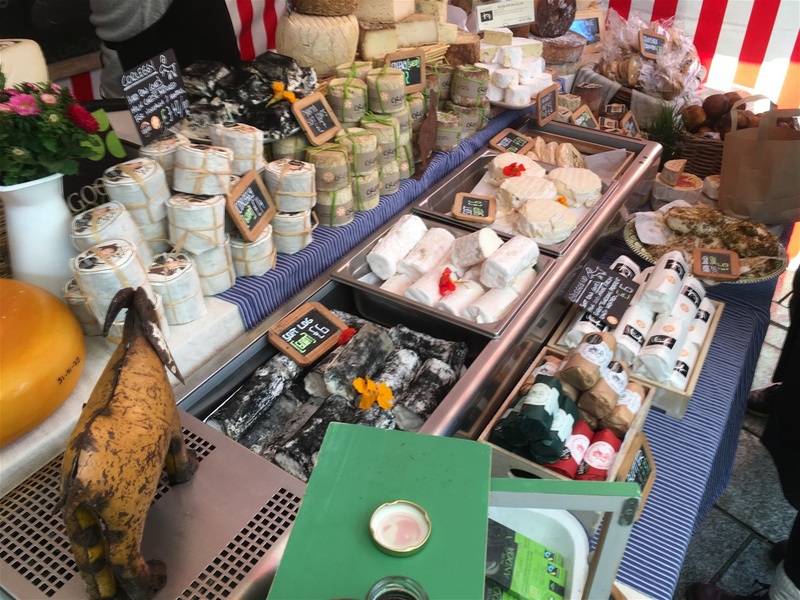 We then headed for Temple Bar open air food market and came across a cheese maker from Corleggy Cheeses showcasing his wares. It's fabulous to be able to talk to a cheese maker about his cheeses and get first hand knowledge, it's definitely a great perk of our job! Ali and I spent an evening presenting a French cheese tasting evening at one of our local schools. This was our first tasting event so it was a bit nerve racking but once we got started the cheeses spoke for themselves! We took 8 cheeses along and talked the A-Level French students through all 8. The Tomme de Savoie was by far the favourite, closely followed by the Camembert de Normandie and then the Sainte Maure de Touraine. We've also had to make up and deliver 20 hampers to our local shooting school where a corporate event was taking place. The hampers were to be given to each of the guests at the end of the day. We chose 4 different mini cheeses for the hampers - a Cheshire truckle, a St Marcellin pot, a baby Capricorn and a Royal Bassett Blue - as well as a small packet of oatcakes to complement them all. Finally we've been out on the road to collect cheeses from our newest local cheese makers. Norton and Yarrow (aka Fraser and Rachel) only started making their goats cheeses at the beginning of 2016 and already they've won awards at both the British Artisan Cheese Awards and the British Cheese Awards. 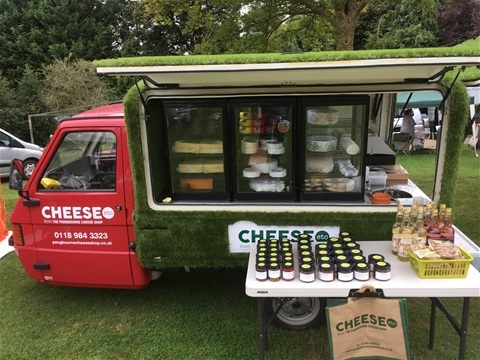 Fraser and Rachel make their cheeses at the Nettlebed Creamery which is a mere 7 miles from our shop 😀 Fraser and Rachel's goat herd is made up entirely of pure bred Anglo Nubian goats. These goats produce a milk with a high fat content and so the resulting cheese is deliciously creamy. 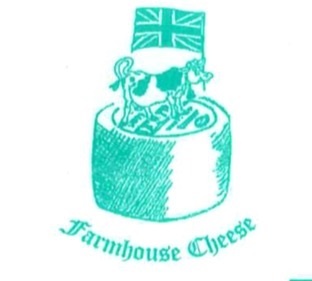 Fraser and Rachel are the only cheesemakers in the UK who make cheese from an exclusively pure bred Anglo Nubian herd. We've tasted their two cheeses - Brightwell Barrow and Sinodun Hill - and can vouch for the creaminess and the amazing taste. 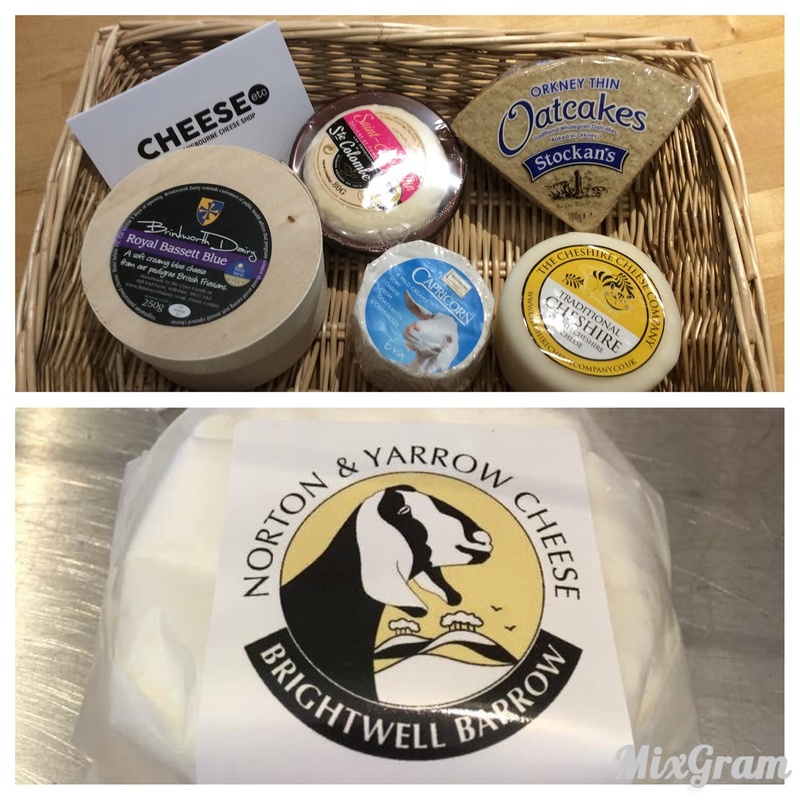 In addition to these two fabulous goats cheeses we stock St Bartholomew cheese which is also made at the Nettlebed Creamery. This weekend saw Ali and I venture out to our first food festival. It was a bit of a step into the unknown and we learnt a lot on Saturday which meant that Sunday ran more smoothly. Overall it was quite scary, thoroughly exhausting and hugely pleasurable. After all, you have to enjoy your job and as it happens I absolutely love mine! We've bought an amazing van to take to markets which is fully kitted out with everything that a cheesemonger on the road could need :-) We have 3 refrigerated display cabinets and 2 further refrigerated units as well as a set of retail scales, running water and the all important kettle! At the end of the day tea is just as important as the cheese. We took several different cheeses with us - a couple of cheddars (Gould's farmhouse mature & Westcombe's mature), a couple of blues (Colston Bassett Stilton & Oxford Blue), a local offering of St Bartholomew, Waterloo, Wigmore & Spenwood, a smattering of goat (Longbow, Rachel & Kidderton Ash) as well as a selection of waxed mini truckles. We had no idea what was going to be popular so we thought we'd cover all bases. Saturday was a tad wet but we had loads of interest in our cheeses as well as lots of compliments about our van. We had to go back to the shop in the evening to restock on waxed truckles - cheddar with caramelised onion & Rioja is a firm favourite of the the people of Wallingford! I set up on my own on Sunday as Ali had to go and play a spot of netball for our team. Luckily she arrived just as the sun came out and with it the crowds of shoppers. We were so flat out all day that I started to lose my voice. Great teamwork saw us through with Ali doing all of the selling whilst I cut, wrapped & weighed the cheese. Ali and I spent Friday travelling up to Leeds to buy a car transporter trailer... Not got much to do with cheese you might think but actually it's a key piece of kit, the use of which will all become clear next week! Having allowed ourselves plenty of time to conquer the M1 roadworks we arrived about an hour early for our scheduled pick up. A quick Google search later and we discovered that Leeds has a fabulous cheese shop and so we thought we'd pay them a visit. George & Joseph can be found on Regent Street in Chapel Allerton and inside this lovely shop you will find its proprietor, Stephen. We spent a fabulous few minutes discussing cheese, exchanging ideas and generally putting the cheese world to rights. Most cheesemongers are happy to talk about their stock, after all we are all in the business as we love cheese so it's easy to rave about it. If you happen to find yourselves in Leeds then I would definitely recommend a visit to see Stephen. He was so welcoming and knowledgable about his cheese and his range of cheeses and accompaniments was excellent.